From my head to your eyes; Colorado and MMJ. Alright everyone, things have been showering the movement in April. Medical Cannabis is really grabbing a foothold in the community and people are more and more aware of the threats against cannabis businesses, progress, and patient rights. Fortunately, this momentum is proving to be a positive force in our society and additional battles of logic, science, and compassion are being won State and local levels. 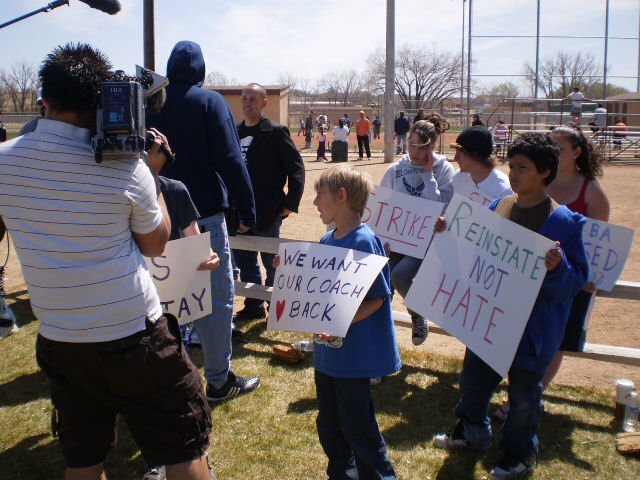 On Saturday , I participated in a protest group of little league baseball players who gathered to speak out against the firing of their coach Jay Sanner by the Fountain Valley Baseball Association. Jay is a veteran coach since 2002, a Disabled Army Veteran, and father of two boys. He had colon cancer and a medical cannabis recommendation for a number of years. Recently, he was fired by the Association out of concern that he would be too messed up on prescriptions and medical cannabis to teach the kids baseball. Audrey Hatfield, president of Coloradoans for Cannabis Patient Rights (C4CPR) held the protest with the activists, supporters, and kids and both channel 13 news and National Geographic were there to film it. Ironically, the baseball association changed the time of the game and “the Association” avoided the media and protest. This is the first time a game time was changed in many years by the association. Despite being a parent of baseball players in the game, Jay Sanner was not informed about the time change (although every other parent was). In addition to this work against disrimination, we also helped raise awareness and fight for the MMJ student/patient “Bill Smith” (alias), whose education was threatened by his school district. School Nurses in Colorado can’t give students MMJ medicine, despite being allowed to give Marinol (synthetic THC). Bill must use an MMJ lozenge to calm the convulsions that affect his lower abdominals to his throat. This rare condition, call myoclonus diaphragmic flutter, is like having severe hiccups that one can’t breathe through and that last sometimes up to 48 hours. It is painful and exhausting. Over the last few weeks I helped “Bill Smith” prepare his speech for the April 20th music festival that took place in America the Beautiful Park. The day was cold and windy, but also peaceful and positive. At the last minute before his speech, “Bill” had an attack and was unable to do more than stand there as I told his story to the crowd and future millions who will know about him in National Geographic next year. A three-part series on Medical Cannabis in Colorado will air in 2012 and it’s exciting to play a part in the history of reintroducing cannabis as legitimate medicine in society. In fact, the CSMCC held an expert panel for educators the week before at the Cheyenne Mountain Zoo called Educating the Educators. This education effort took place after the school district recanted their position to allow “Bill Smith” to return to school after medicating with cannabis. Included in the panel of experts were lawyers Cliff Black and Brian Vicente, medical cannabis physician Dr. Gedde, and internationally renowned cannabinoid biologist Dr. Robert Melemede. CSMCC President Tanya Garduno also participated in the discussion. We invited multiple educators, superintendents, and discipline officers to learn what medical cannabis products might look like and how to use compassion in dealing with medical cannabis patients who are students in the public education system. No student should be denied the right to education simply because of their medication or condition. The entire family has been very grateful and the story has spread far and wide as an example of how stigma should not be used to judge cannabis patients. Tolerance and understanding are needed to remove the difficulty patients face when using cannabis as medicine for their health. Along these lines, CSMCC president Tanya Garduno also participated with the Colorado Springs Human Resources Association in thier MMJ disussion about employing medical cannabis patients. The overall response in the private sector is for HR professionals to treat medical cannabis as any other drug. Patient employees should maintain discression and avoid over-medicating when on the job. Every employer still has the right to choose and can fire an employee for any reason in Colorado. Patients should still be hesitant about disclosing thier use of cannabis, especially in jobs that have clear guidelines about drug use. For the most part, HR professionals are teaching compassionate understanding and non-discrimination against patients who use medical cannabis to treat thier condition. In less fortunate news, patients lost two great voices on City Council as a result of this election. Unfortunately, both Sean Paige and Tom Gallagher did not receive enough votes and will be replaced by new political powers who may not be aware of medical cannabis and patient issues. We’ve already begun proactively educating these new politicians with tours of medical cannabis facilities and operations. We can only hope they are sympathetic to the cause and take the advice of former City Council that consistently promised “a favorable business environment” for medical cannabis in Colorado Springs. On May 8, we hope Richard Skorman will have enough votes to beat developer Steve Bach in the mayor race. Everyone needs to register to vote as this is a City Mail-in Ballot election ONLY. The new form of government called “strong mayor” will be tested with one of these two men, its important the power be given to Skorman so businesses and patients can have protection from their politicians. Check out the new local e-zine for medical cannabis news in Colorado Springs: www.greenleaf420.com – kudos to these guys for covering the issues as we face them. I belong to a new generation of market pioneers in the fastest growing industry in Colorado today. As a double business major in international business and finance I’ve studied the economic viability of medical marijuana centers in Colorado Springs. I’ve learned firsthand the in and outs of this industry and what it takes to progressively move brand new markets forward. As Membership Director for the Colorado Springs Medical Cannabis Council, I have seen the industry in Colorado blossom despite countless economic, political, legislative, and social barriers. I strive to deliver objective truth about medical cannabis issues and their economic, social, and medical implications for Colorado. This entry was posted in Politics and Medical Cannabis and tagged Audrey Hatfield, Bill Smith Story, Brian Vicente, C4CPR, Cannabis and employment, Cliff Black, colorado medical marijuana, Colorado MMJ Industry, colorado springs, Colorado Springs City Council, Colorado Springs Human Resources Association, Colorado Springs Medical marijuana, CSMCC, Darryl Glenn, Dr. Bob Melemede, Dr. Gedde, Educating Educators, Fountain valley Baseball, Greenleaf 420, Hiring mmj patients, HR opinion, Jay Sanner, medical cannabis employers, Medical Marijuana, medical marijuana employees, MMJ patient rights, National geographic medical marijuana, patient protest, Politics and Medical Cannabis, Richard Skorman, Steve Bach, tanya garduno. Bookmark the permalink.